The Ministry of Food encouraged people not to waste food and to grow their own, if possible, because of rationing. A ‘Dig for Victory’ campaign was started and people were urged to use any spare land to grow vegetables – this included: parks, golf clubs and even the moat at the Tower of London. 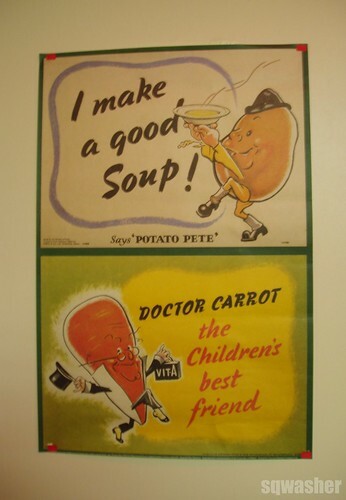 ‘Doctor Carrot’ and ‘Potato Pete’ were cartoon characters featured on the campaign posters and they encouraged people to turn their flowerbeds into allotments. This home-grown produce could then be used to supplement rationed food. Recipes were also given out suggesting new ways to cook vegetables, including ‘curried carrot’ and ‘carotade’ – a drink made from carrots and sweets. Professional gardeners toured schools and gardening societies giving advice to beginners. Children helped by doing the weeding and those on farms by picking fruit. By 1943, there were 3.5 million allotments in Britain, producing over a million tonnes of vegetables. Many people also kept: ducks and rabbits to eat and chickens for eggs. ‘Pig Clubs’ were started for collecting food leftovers in big bins to feed the pigs.